Here's the update for my previously released USN Fleet Carriers. This update includes USS Saratoga CV-3 and USS Essex CV-9 in their own slots using class files asheshouse so generously provided for this mod. 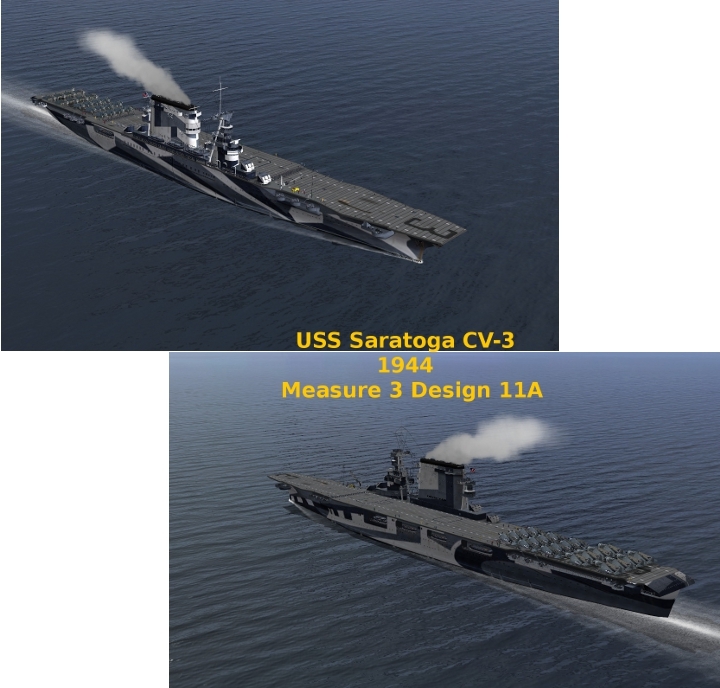 USS Saratoga CV-3 has two versions included: Measure 21, used in 1943 and 1945, as well as Measure 3 Design 11A. 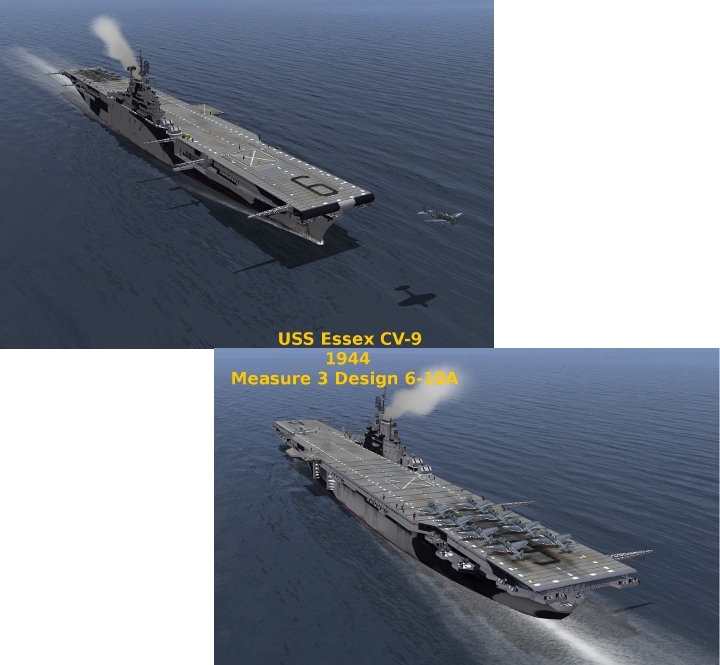 USS Essex CV-9 has two versions included: Measure 21, used in 1943 and 1945, and Measure 3 Design 6-10A. There are two downloads available. Both downloads include the necessary Readmes. As before I bumped the maximum speed up for USS Essex to 33 knots - 61km/h. Sara was bumped only .5 knot to 35 knots - 64km/h. These ships are for use in the South Pacific. The Measure 3 ships were all painted in these Designs during 1944. USS Franklin CV-13 had Design 6A in late 1943 through February 1944. There was a conversion period of March to May when the starboard side had Design 6A and the port side had Design 3A - I didn't model this period. I did model the period subsequent to May 1944. 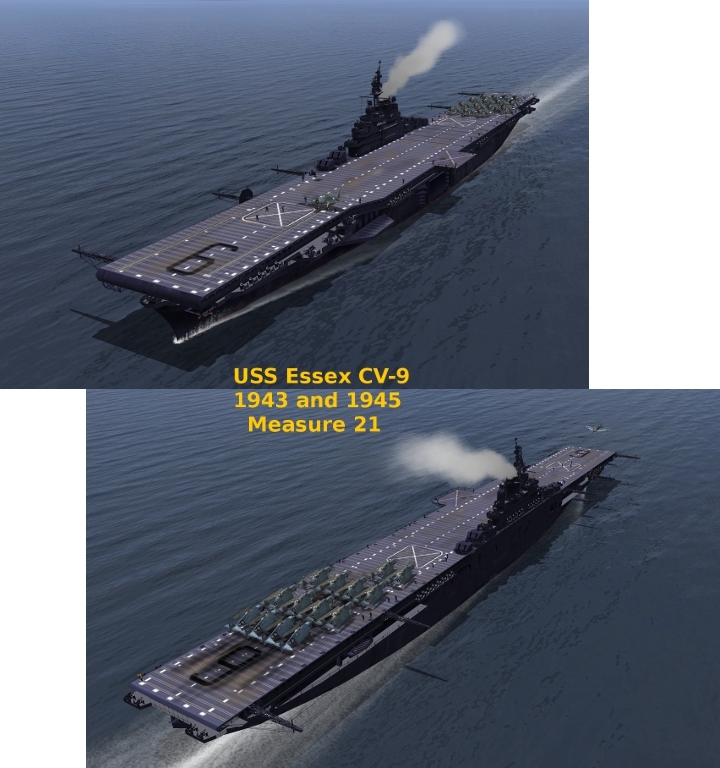 I've included USS Lexington CV-16 and one Generic CV-9 Class both in Measure 21 Navy Blue. Lex of course wore this Measure from 1943 until May of 1945 and most of the rest of the CV-9 Class adopted this Measure in 1945. Essex, Yorktown, Intrepid, Bunker Hill and Wasp all wore this Measure in 1943 as well. USS Lexington can't be sunk. She was known as the Blue Ghost and the Japanese considered her unsinkable. "She sinks beneath the deep blue seas each evening, all hands aboard, only to re-appear each morning on the horizon." If there are any problems please let me know and I'll do my best to help fix them. I hope you have as much fun using these as I did making them. 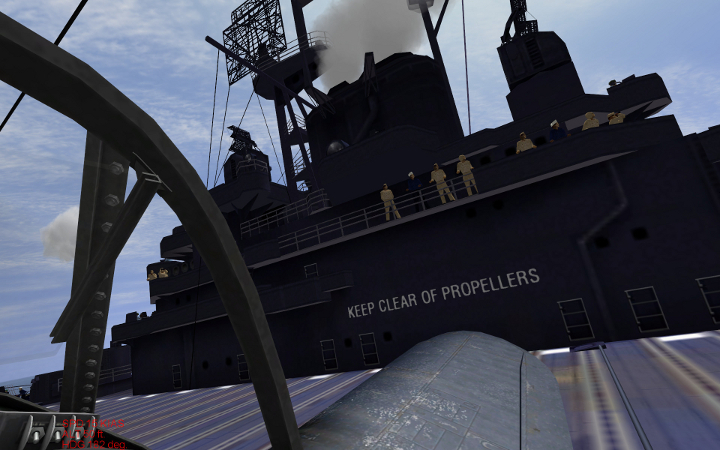 Ranwers has recently released his Carrier Crew v5. I went in and revised my Fleet Carriers adding this mod to them. 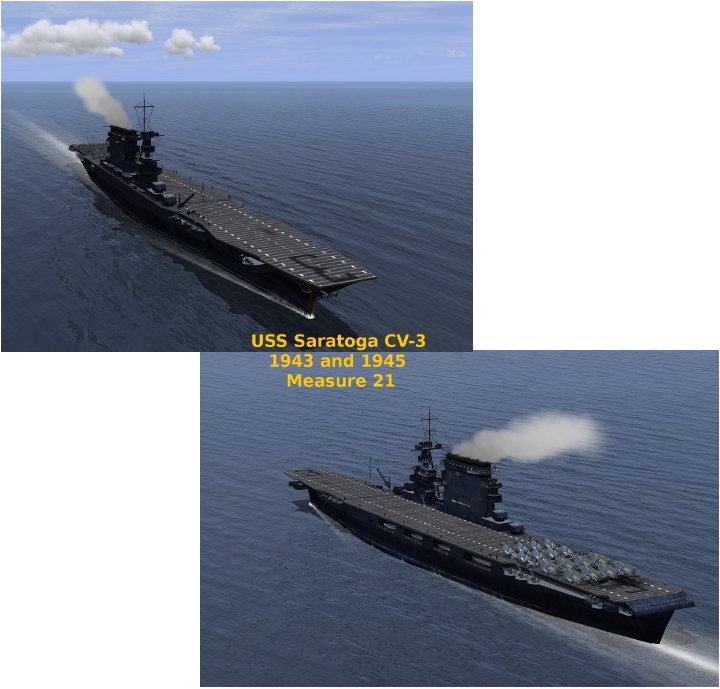 With Ranwers' help I was able to separate the crews of the carriers in Measure 21 - USS Saratoga CV-3; USS Essex CV-9; USS Lexington CV-16; and USS Generic CV-9 Class - from the rest of the deck crews. I painted these crewmembers and the tractors to better reflect the uniforms and paint worn during combat operations on these ships. I highly recommend this mod for the on-deck immersion value. Thanks very much. I'll try the full download. Cant have enough carriers. I really like the the paint schemes. Awesome work, thanks so much. I work for a company with over 100 school buses. Looking at the weathering of these, and keeping in mind there are vehicles spanning a decade, the weathering on them is very similar. The fuel drips, hinge oiling, hub grease, and rust are, except for those who keep their vehicles squeaky clean, all very consistent. There were rules for the painting of these vessels and all were less than a year old at any given time - Measure 21 replaced measure 3 at the end of '44. Therefore, the decks would be a fairly consistent colour and the 5N, 5O, and 5L paints would have faded over time but not too significantly. The environment was not considered as it is today and an awful lot of stuff was jettisoned overboard with no thought at all. Decks needed swabbing and any oil and/or fuel would just be slung out the nearest opening to drip down the hull into the sea. Replenishment at sea would cause spillage at the hatches and dings around those hatches which would rust quickly in the sea air causing stains. All of these occurrences would be consistent from ship to ship and the weathering would reflect this. Get down on the deck and look carefully; you'll find new paint patches on a couple of decks; oil/fuel spills; small burn marks that haven't been repaired yet; and the fresh scars on the island of USS Essex CV-9 1944 where Capt. William C. Harger's Hellcat left marks when the cable failed at the last second. 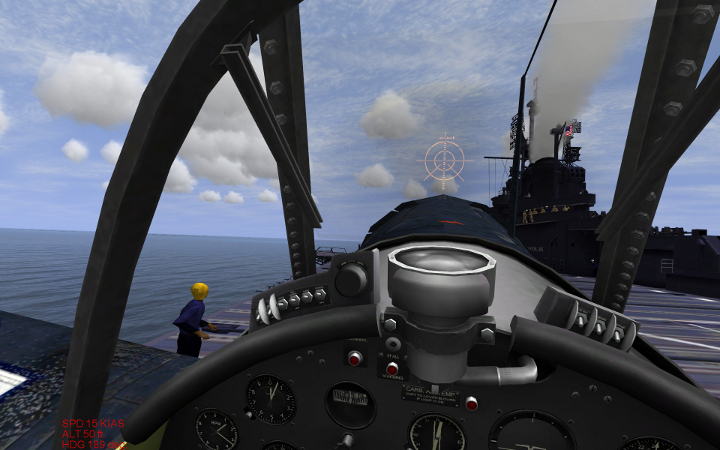 These are the things you'll notice the most since, as naval aviators, 90% of our time on the vessel in this game is on the deck. Unless you fall off the deck and float along in your dingy (something I'm very familiar with). Most of the other ships' decks were more generic with less character; all the usable photos were in black and white. I hope this explains the lack of "variety in the deck colors and weathering." Thanks very much- they look great. Thanks for the kind words. Kinda got thin-skinned there for a moment. I had second thoughts after I posted the reply to HundertzehnGustav but I'm glad I got it off my chest. Anyway, SAS~GJE52: the next project will be the CVLs. I'll have all the CVLs ready for the game in two weeks. Sorry. That's a JOKE!! I already found one major problem with them - the port side of the hull is the mirror image of the starboard side. Now, I have to decide, and I'll put this to the community, which side should I do - the port side or the starboard side. A thought that comes to mind is, for example: USS Independence and USS Bataan shared Measure 3 Design 8A. I could do the port side of USS Independence in Design 8A that would be reflected on the starboard side then do USS Bataan with the starboard side in Design 8A that would be reflected on the port side. What do you all think? Yes, see your problem. It is one of the drawbacks in putting a large object onto a 1024x1024 skin especially when you think both sides will be the same. I think your solution could be the only way forward atm. Cool beans Plowshare! This and mods like it are not only awesome, but necessary! The Bunker Hill will be useful for more than just WW2 also. I DID have a 70% crash.. but then I took a peek inside the folder and the class files 'were sold seperately".